I used to complain about doing the laundry until we bought a fully-automatic washing machine three years ago. Our old one was a spinner/washer type only so I still have to wring out the clothes. When we got a fully-automatic washing machine, doing the laundry is faster and easier. There's still one more thing I have to deal with though. My husband does not like his premium clothes spinned in the washing machine. He still prefers the old-school "kuskos-piga" hand wash. He insists that colored clothes easily fades with machine wash. Spinning usually destroys the fabric and even shrinks the clothes. With our lifestyle and busy schedule, multi tasking is best way to deal with it. Last weekend I was in the supermarket for our weekly grocery. I was scanning at the laundry detergent sections looking for a bar soap. My husband prefers to use it than liquid detergent for his clothes. I've tried all the products in the display rack except for one brand, Perwoll Color. It has been raining since last week thus a pile of laundry sits in our bedroom hallway. I hate it, but I don't want to wash them and let the dryer do its job alone. I still prefer sun-drying our clothes. It makes colored clothes brighter. 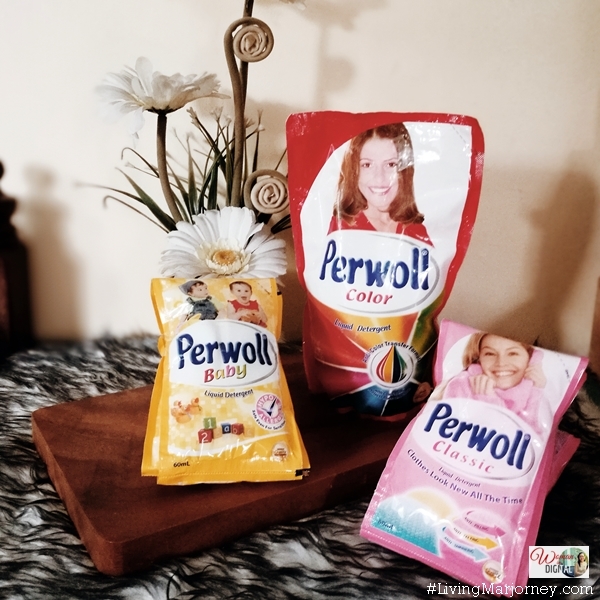 Perwoll is a German laundry detergent brand. Henkel is known in the Laundry & Home Care and Beauty Care businesses in Germany. 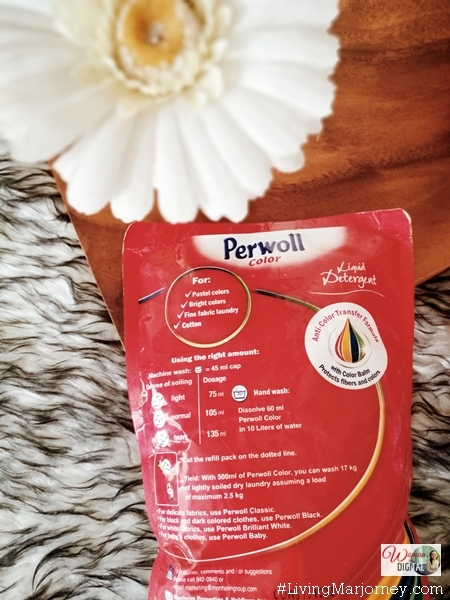 In the Philippines, Perwoll is available in leading supermarkets. The 500ml pouch retails at Php141 at Rustan's Supermarket. There's also Perwoll Black (Php 171.00) which is a bit expensive compared to the classic. Perwoll Color is recommended for pastel, bright colored, cotton and fine fabric laundry. It has Fiber rebonding technology that promises to prevent colors from fading. After using Perwoll Color on my laundry, I found that it has a thick, milky white consistency with a mild perfume-type scent. I used 2 caps-full for three queen-sized bed sheets. Set a laundry schedule especially if you're living in a community and using communal laundry facility. That way, you never waste time waiting for your turn. I could not work in a messy, unorganized place but my home is a mess right now until we finished the organizing and de-cluttering. I have a plan for my laundry room in the future. It's going to be a nice space where we will keep our laundry paraphernalia and clothes. I will put a wall paper just like in our bedroom. That way it's not an eye sore. My clothes can breathe and I can breathe as well. Organize your laundry room with lovely baskets. Then separate clothes according to colors and fabric. Silk with other silk clothes, whites, colored, blankets, towels (whites separated from colored ones). Organize laundry detergents and other supplies. Bring back to its original place. It saves time and effort. Use gentle laundry detergent and fabric conditioner. Perwoll did a great job in my laundry. The colored clothes were cleaned well. The fabric are soft and even smells great. Its Anti-Color Transfer Formula prevents the fabric from fading which happens when using most detergent soaps. 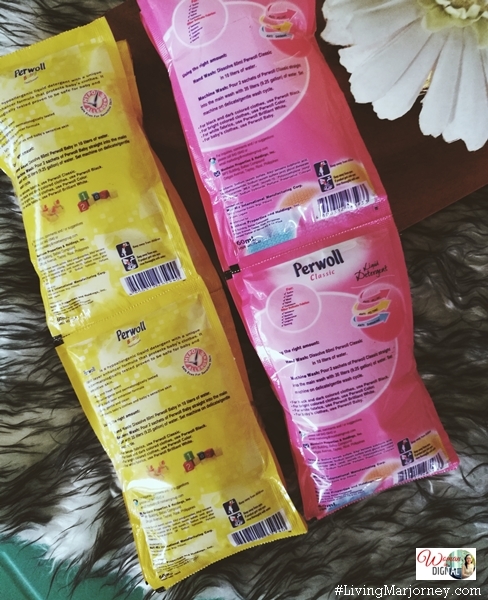 I will definitely try other variants of Perwoll especially the Perwoll White and Perwoll Baby. Do you have home tips you would like to share? Leave in the comment section. Gumagamit ka na rin pala ng Perwoll Color, cool! Gusto ko rin yung Perwoll Black sa dami ng damit kong black at makukulay. This sounds great. I do TONS of laundry and I want to keep my clothes looking their best! I will check this out. Clothing can fade and look worn when washed over and over. I love that this product you found fights the fade and pilling. I would love to try this out. This sounds like it would come in handy. I always want my clothes to keep their color and NOT shrink. I hate when my clothes shrink! I have never seen that brand, but it sounds like it works great. I pretty much have to do laundry every day just to keep up! I've never heard of this brand but it looks like it look it does a great job! I would love to try this out! This sounds absolutely fantastic, I think it is a must being able to keep your laundry looking its best! I could feel your dilemma on clothes maintaining their color when they are sundried. It's nice you found an effective brand in Perwol. Anything that will keep my clothes the bright vibrant colors they should be I am all for it. I don't believe they sell this by my house but if they did I would definitely buy it. Anything that keeps me close the bright vibrant color they were when I originally bought them I am all for it. I don't believe they sell this laundry detergent by me but if they did I would be totally buying it! I've never seen a bar of laundry soap before. My grandma was big on handwashing, she chose to wash many things that way. Haven't heard of this product before. Will have to see if I can find in the local stores. Genius idea! I haven't heard of this, I have to look for it! I'm always nervous about clothes loosing their color! I think this is a good product to help make laundry tasks a bit easier. Awesome that it helps preserve the clothes' colors and keeps them bright and soft. This is great news! I have a few clothes that I love so much and I fear their colors might fade with frequent runs in the washer. I will have to look for this kind of laundry detergent when I do my grocery shopping this weekend. I have never heard of this brand before! I am going to have to try it out. Color fading drives me absolutely crazy! I have never heard of this brand. This is great news though, I do struggle with the colors fading. Seeing colors fade after washing is completely aggravating. I hope this will do the trick in preventing that! I've never heard of this product - glad it is working for you and your family. And I'm glad you have a fully automatic washer - I bet it's saving you a lot of work! You are right automatic washing machines do result in clothes wearing out faster and colour too fading much faster. Washing those important clothes outside of the machine with some quality soap powder is a good idea.